Samsung has now got down to the business of selling the Galaxy S10. Initial reports suggest the company is seeing strong demand for its new flagship series. It has ramped up its promotional and marketing blitz across the globe to get the word out about its latest and greatest Galaxy S device. The company has put up a clever billboard in Sydney, Australia, which promotes the Wireless PowerShare feature of the new series. It’s a uniquely interactive installation which teaches people about one of the Galaxy S10’s marquee features. We’ve already explained in detail what is Wireless PowerShare and how you can use it on the Galaxy S10. The feature allows you to use your Galaxy S10 to charge another Qi-enabled device. So you could reverse wireless charge your Galaxy Buds or Galaxy Watch but you could also do it for a Galaxy Note 9 or even an iPhone. 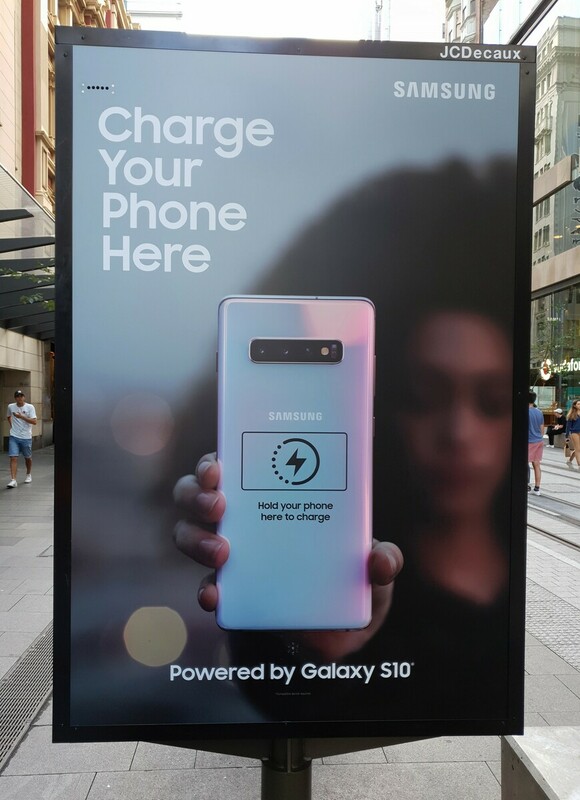 This Galaxy S10 billboard was spotted by the folks at Notebookcheck on George Street in Sydney’s business district. It invites people to charge their phone by placing it on the Galaxy S10 image in the billboard. There obviously won’t be a real Galaxy S10 inside, just a regular Qi wireless charger, but that would help you get the idea about Wireless PowerShare. Do keep in mind that while regular Qi wireless chargers are rated to 9-10W, Wireless PowerShare is slower at 4.5W. So nobody will be just standing there holding up there phone against the billboard to charge it fully. It’s unique and does a good job of informing people about Wireless PowerShare on the Galaxy S10, so props to the folks in marketing. Have you spotted any interesting Galaxy S10 marketing materials in your city? Let us know in the comments below. In another article you write about that S10 have faster wireless charging. It is true or not ? What about PMA devices ? Really not see a use for this yet, though I have yet to reciveve my ear buds. Personally too selfish to share my battery and if push comes to shove. There is something that is faster and better called a power bank. You can’t charge the phone and the accessories at the same time using wireless power share. That’s a Galaxy Fold exclusive function. I don’t know where you heard this from, but you’re mistaken. The feature works just fine on the S10+. I use it to charge my Gear Sport while my phone charges when I’m on a trip. You can charge the phone and an accessory just fine I have done it. Sammobile even did an article on it.